SummitArtspace on East Market is closed tomorrow, Thursday, Jan. 31, 2019, with plans to open on Friday, Feb. 1, for gallery hours, 12-7 p.m., and Saturday hours, Feb. 2, 12-9 p.m., which includes February Artwalk 2019. ❤️ this ❄️winter painting of Furnace Run by Rick Surowicz of #Medina which earned an honorable mention in the 2018 Kaleidoscope Holiday Show. FYI! 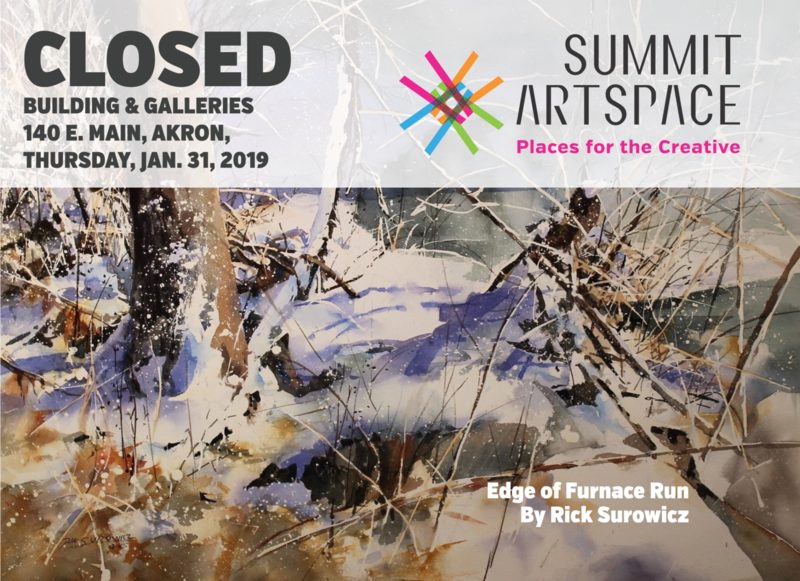 Summit Artspace on Tusc is in between exhibits and is closed this weekend, Friday-Saturday Feb 1 and 2, 2019. Open for Feb. 9 Downtown Cookie Crawl 🍪 in #Barberton.